Learn to find and play the role God wants most for you to play, not the ones you feel pressured into playing for the sake of others or even our sense of accomplishment and worth. Most of us spend a lot of our lives figuring out when to say yes and when to say no. How to manage our time, reduce stress, do our best for our families, find a little space for "me." But we don't find space for our souls until we learn to step past the yes and no of daily decisions and seek a third option: the best yes. The best yes is the choice that shapes all our other choices. (And our choices determine the direction of our lives.) It's what allows us to play our necessary parts in God's plan, to spend our energy and focus our passion on the assignments that really are ours. It allows us to be there for the moments we shouldn't miss, pursue the calling our souls pulse to fulfill, give the love we were born to offer. How do we learn to say that best yes? It requires honesty. Imagination. Attention. Trust. Humility. Practice--lots of practice. And wisdom. The best yes is really all about wisdom--learning to make truly wise decisons. And that's the heart of this book. "I want us to become powerfully effective decision makers," writes Lysa Terkeurst. "Because then we will live powerfully effective lives. And spend our souls doing powerfully effective work to the glory of God." 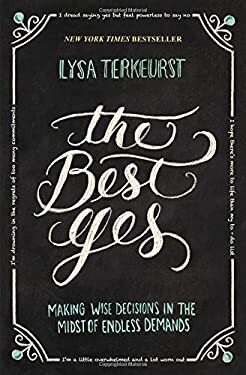 With her signature mix of transparency, Scripture-laced insight, and "been there" humor, she suggests usable strategies for choosing wisely and encourages us all to shout and whisper our own best yes to life, day by decision-making day. New (5384 available) BRAND NEW. Over 1.5 million happy customers. 100% money-back guarantee. Make your purchase count: support Better World Books' worldwide literacy partners.